Stronghold Blue for cats prevents heartworms, fleas and other harmful parasites. You may still place an order, however we will send 2x3pack instead. hello~ when is the expiry date of this product? and dose it have a same ingredients with the revolution one? and which country made come from? We have over 2 years expiry date on our products and Stronghold is exactly the same product as Revolution. It is manufactured in Europe and will be shipped from the UK. I wonder if Strongold has been approved by the FDA, a reputable organization like Revolution. It is said that the ingredients are the same, but I wonder if they are the same or the alternatives. I'd like to try Stronghold on my children, but I ask because there are many concerns. I hope you understand. Stronghold and Revolution are exactly the same product, produced by Zoetis. The manufacturer sell this product under "Stronghold" brand in Europe and as "Revolution" in the USA and Australia. 3.2kg Can I use it all for cats? I'm curious about the capacity. 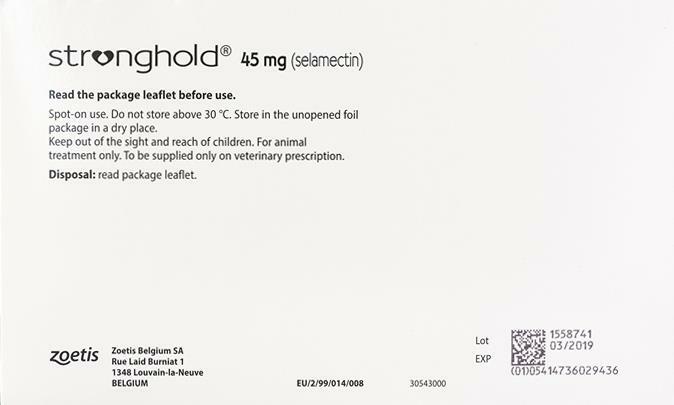 I've used Stronghold (bought here) for a long time, and love it, but lately I'm finding it ineffective - the fleas are happy, the cats less so.... could a batch have been defective, or perhaps the fleas developed immunity and I should switch to something else for a while? Sometimes switching to a different product after many years of using the same one helps. However there can be several reasons such fleas life cycles, environment etc that can mean you see fleas more often. We recommend you get advise from your vet. If I do a recurring purchase, how do I know what the price will be for the next shipment? Will it always be the same price or can it fluctuate more than 10%? I'm buying it at a sale price, would it be regular price next time? We don't change our prices unless the manufacturer increase theirs. Also we send you 2 notifications - one 2 weeks before and other one a week before the auto-order. These e-mails contain all the details including the price. You can always cancel / edit your recurring order easily from our website. I can now afford to give all four of my cats meds they need for earmites and other conditions they have. It was very difficult to get meds from local vet and expensive. Thanks Pet Bucket. Not sure if it works because I use it on my feral kitties that I can pet, but not well enough that I can check them for fleas. But the kitties I do use it on look pretty good, which I suspect may be related to the flea meds. This Stronghold is an excellent product for our cats! quick delivery and excellent customer service. 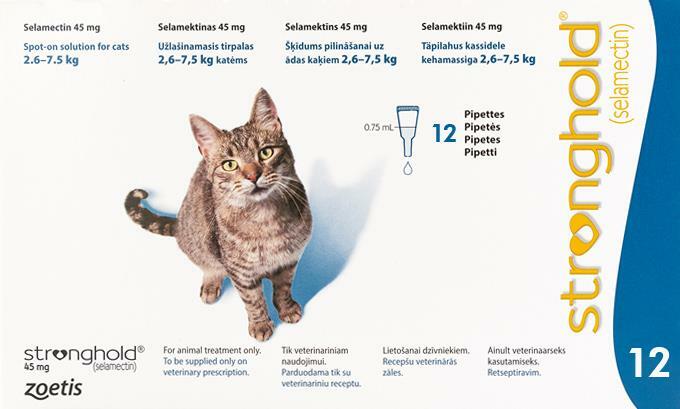 Have used this formula for many years have great healthy kitties. My pets (2) have been using this product for years now, as a vet recommendation. It Works!! have never had a problem. Very satisfied.